When discussing the deteriorating plight of the leveraged loan market last night, we noted that according to Lipper, US Loan Funds just saw a fourth consecutive, and record $2.5 billion outflow in the past week. 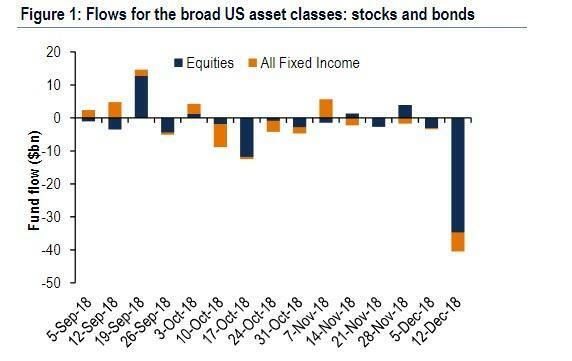 That was not all, however, because in the same report Lipper also found the largest outflows on record from stocks ($46BN), the largest outflows since December 2015 from taxable bond ($13.4BN) and Investment Grade bond ($3.7BN) funds, and the 4th consecutive week of outflows from high yield bonds ($2.1BN), offset by a panic rush into cash as money market funds attracted over $81BN in inflows, the largest inflow on record. Picking up on these very troubling flow trends, in his latest Flow Show note, BofA's Michael Hartnett, this time using EPFR source data, found nothing short of investor "Capitulation", reporting that global equity funds saw outflows of $39 billion in the week to Dec. 12 - the largest ever weekly outflows from stock funds - comprising of $14.0BN in ETF inflows offset by $53.0BN in mutual fund outflows, $8.4 billion in IG bond outflows, and all-time largest week of equity & bond redemptions. 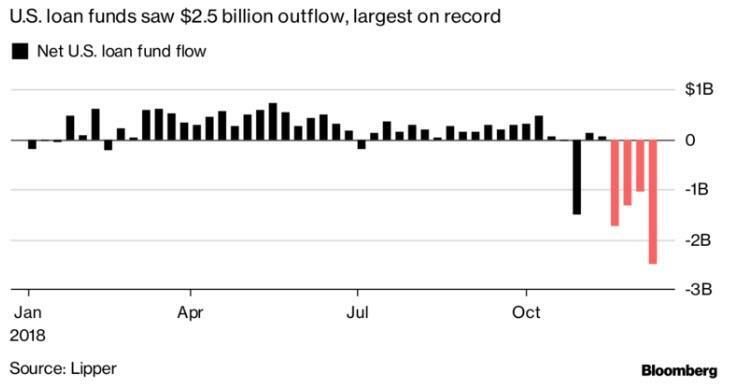 U.S. equity funds suffered redemptions of $27.6 billion, the second-largest weekly outflows on record and only behind the record outflows following the February VIX spike. The week of Dec 12 captured last Friday's furtious plunge in the S&P which clearly sparked panic liquidation among investors, contrary to what JPM's Marko Kolanovic was saying on that very day. Elsewhere, European equity funds saw $4.5 BN outflows, with redemptions in 39 of the past 40 weeks. Looking at the UK, Hartnett sees another "Brexit" as U.K. equity funds have seen record YTD redemptions, amounting to $9.8BN. Offsetting these outflows, traders tentatively allocated funds to Japanese and emerging-market equity funds, which saw $2.3BN and $0.2BN in inflows, respectively. Hartnett also points out last week's "Crexit", which saw record IG bond fund outflows ($8.4bn); record Bank loan fund outflows ($2.4bn); HY bond outflows for 9 of past 10 weeks ($3.2bn); EM debt outflows for 10th week ($0.9bn); and 12th week of muni fund outflows ($0.7bn). 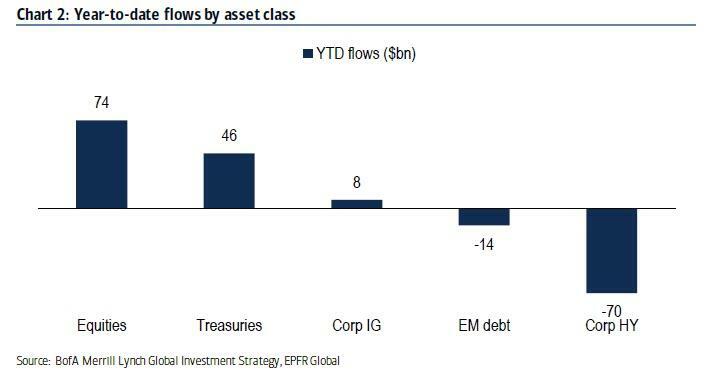 In total, YTD has seen a record $63bn redemptions in HY+IG vs. $74bn inflows to stocks & $46bn inflows to govt bonds. 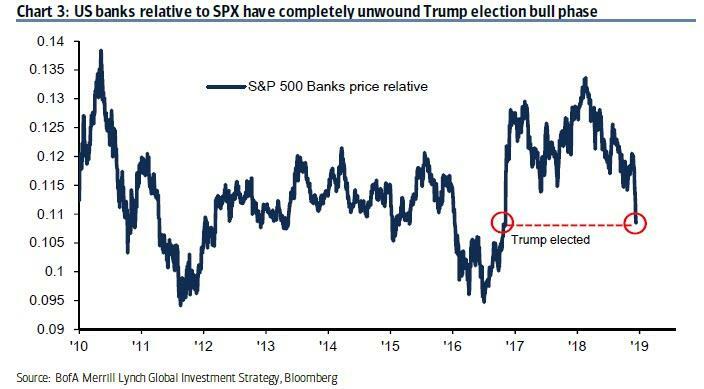 Drilling down by sector, Hartnett finally notes the "Bankxit" as a result of the fourth largest week ever of redemptions ($2.1bn) from financials, with the BofA strategist noting that US banks relative to SPX have completely unwound Trump election bull phase. The negative sentiment surrounding U.S. stocks showed no signs of dissipating on Friday as S&P 500 futures fell again following dismal economic data from China and Europe, while trade concerns were fueled by Apple saying a Chinese ban on sales of the iPhone will force it to settle a licensing battle with Qualcomm an outcome that may end up harming the country’s smartphone industry. 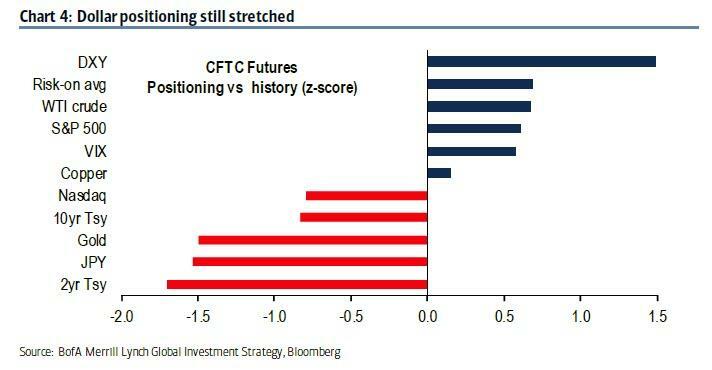 Summarizing the above, Hartnett writes that markets are "Losing the plot" as it is rare for combo of such capitulation out of risk, capitulation into US dollar (CTFC long dollar position 1.5sd above norm – Chart 4) & Fed dovishness not to spark rally, and writes that "the only reason it would not is fear of “credit event” & “policy impotence." And should the Fed no longer be able to boost animal spirits, watch out below as a decade of artificial gains is promptly unwound.